I was thinking about bloging yesterday.Nevertheless I felt guilty playing the com the whole day and decided to leafed through my sejarah book plus giving my com a short break. I read an article from New Straits Times yesterday written by Gavin Yap which actually impressed me.Generally it was about his impression about CNY. On CNY'S eve my whole family sat down together for a sumptous meal in a restaurant located in PJ. As a traditional ritual we went visiting our friends and relatives on the first day. As a matter of fact, my friends and I agreed to go 'lepak' today. Lynn,Lilian, and few of her church friends went off to a movie. That means Shanz and I were left with no one.We had all come to an agreement to 'lepak' in the new jusco. We ate in the food court and I gave the food a 5/10 rating.Completely tasteless.Although I said that it was mouth-watering.Then we head of meandering around the mall.We entered a souvenir shop and found out that everything there is only RM5.You have to agree with me its dirt cheap.Anyway after loitering in the shop and turning around about 6 rounds(never really counted it) I actually bought a big photo frame. 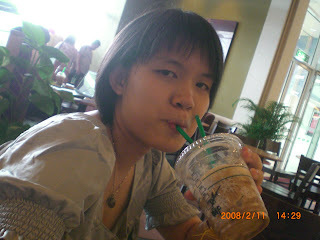 Then we headed downstairs to Starbucks and by that time my legs were already aching. I fell for the aroma of the coffee.I felt a lurch of desire and persuaded Shankry to share with me. 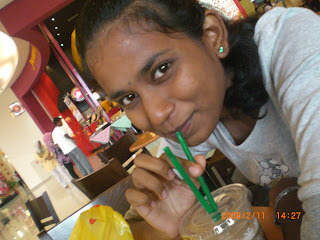 We eventually make up our mind and go for an ice-blended mocha and boy its RM 12.08. Until now, the figure is still vivid in my mind.